Have you seen the viral video of actress Mila Kunis and BBC Radio 1’s Chris Stark? Kunis was on the interview circuit for Oz the Great and Powerful, in which she plays the witch Theodora, and sat down with Stark for a segment on the Scott Mills show. A conversation, where both people talk and learn is much better than an interrogation (where one person simply rattles off a series of questions) or a speech (where one person simply rattles off a series of facts). Boilerplate questions and answers can give some useful information, but after you get them out of the way (Where are you from? What’s your job/major? What do you miss most from your home?) It’s obvious that the reason this video is popular isn’t because we learn that Kunis “loved working with James Franco.” Actually, the biggest scoop probably is finding out that she used to be a bartender. You may need to listen to the voice inside your head (or off camera) to get you back on track if you start talking too much about yourself, but it’s even better just to listen to the voice across from you. Showing an interest in someone else’s story is a great way to put that person at ease, so is finding something you have in common, which is probably easier than you might think. Realize that words may need defining. Football isn’t always football. And a pie isn’t always a pie. It’s one thing to invite people into talking about your world. It’s even better to invite them to experience it themselves. Too bad Kunis has that silly movie she’s working on in June. Understand that there are cultures within cultures, and not everyone represents an entire country or continent. I really don’t think that “dropping trou” at wedding parties is common with all people all across the UK (though I’m open to learning otherwise). Have gifts on hand. 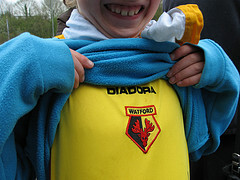 Imagine how much it would have impressed Kunis if Stark had been able to pull out a Watford jersey—even a yellow one. Thanks, Janet, for dropping by. And thanks for the encouraging words. You are currently reading 10 Lessons for Cross-Cultural Conversations from That Mila Kunis Interview at Clearing Customs.